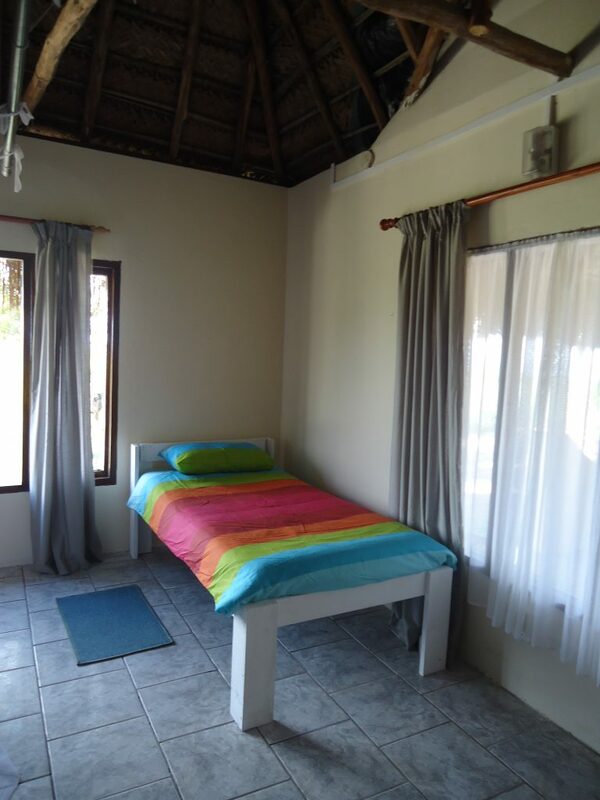 Choose from one of our self-catering cottages at Sunset Lodge. 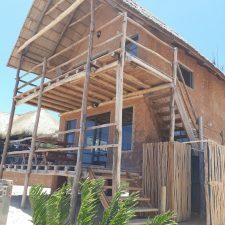 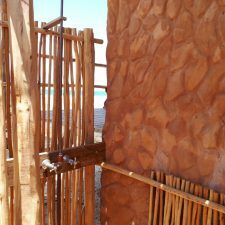 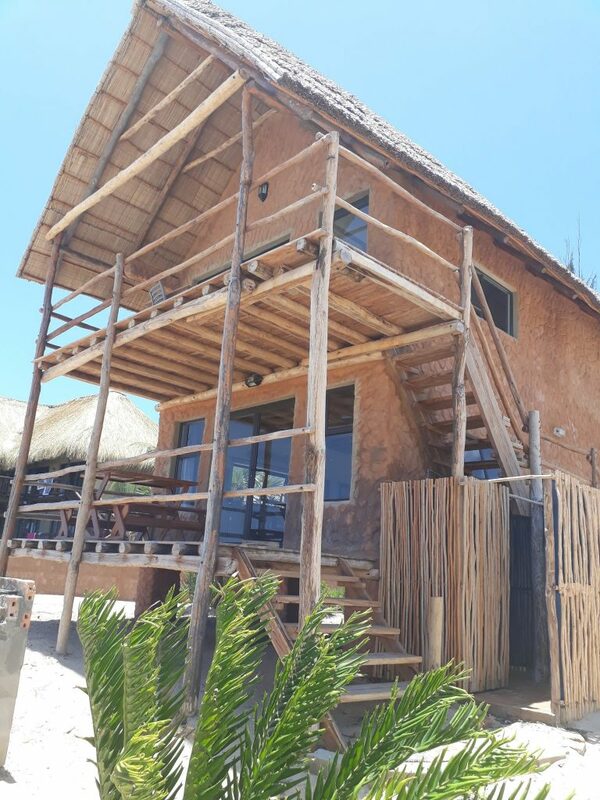 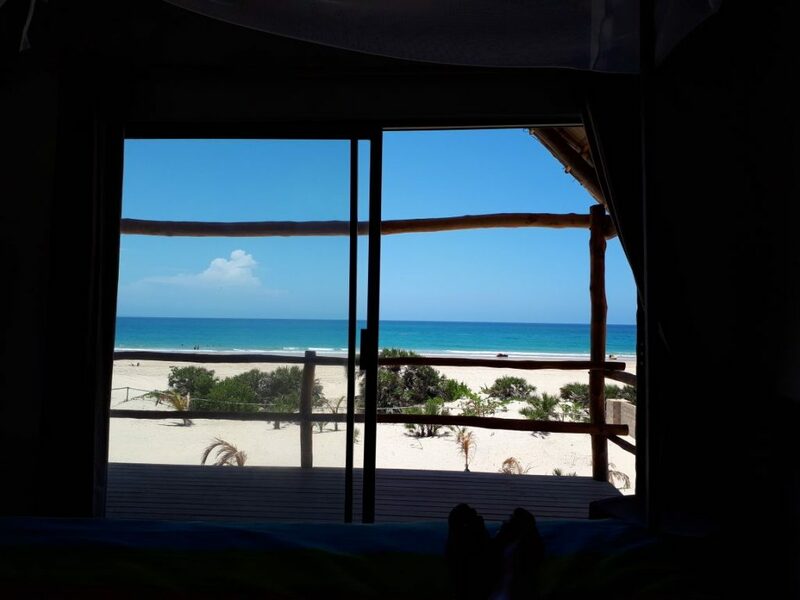 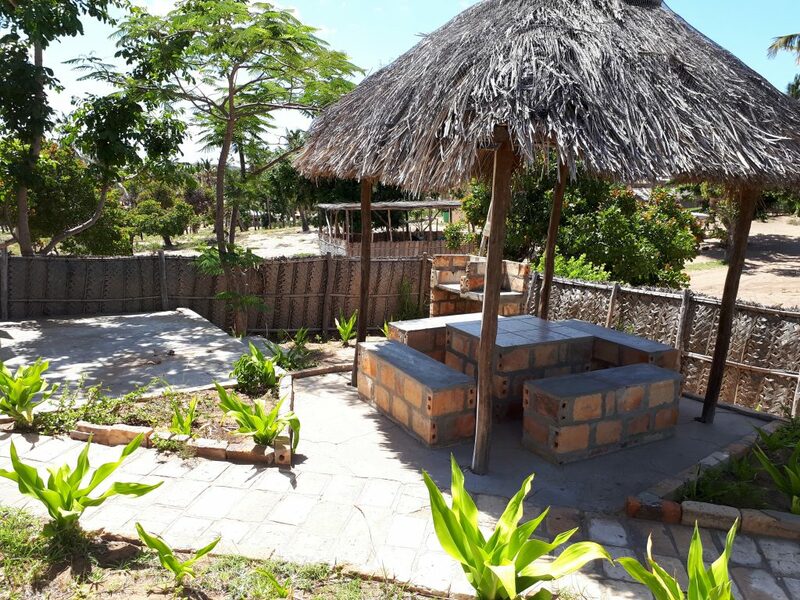 Our cool, rustic chalets built with thatched roofs surrounds you with nothing but practical comforts and the sounds of pure paradise. 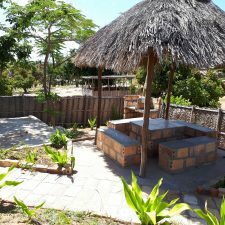 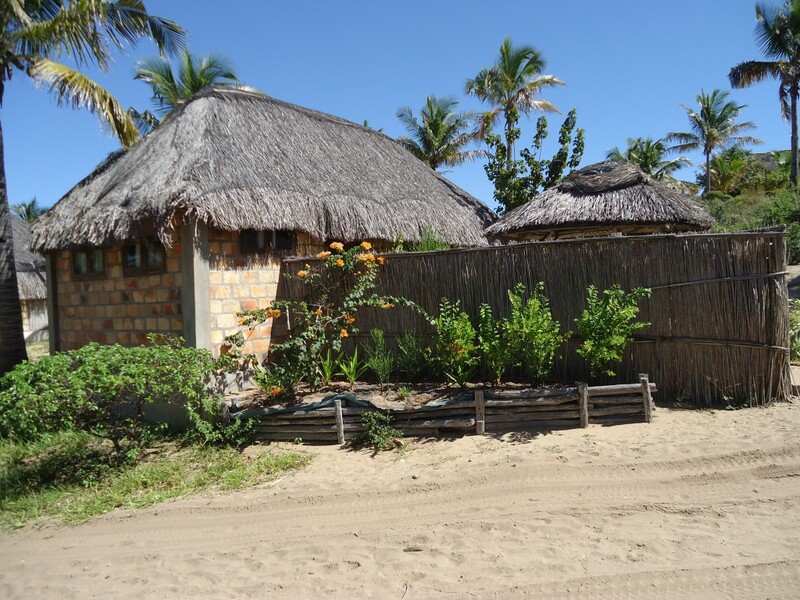 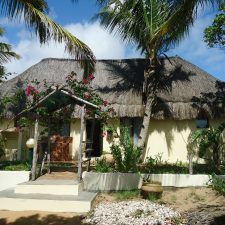 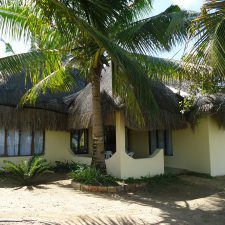 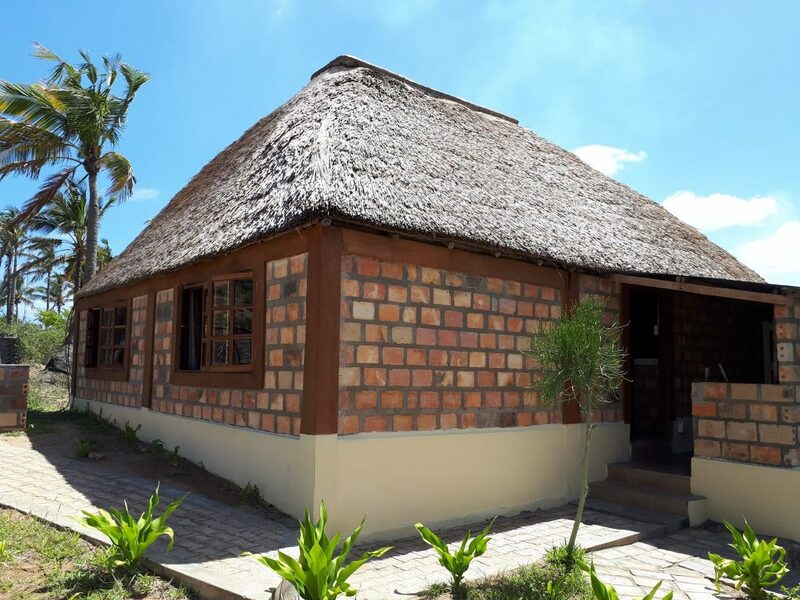 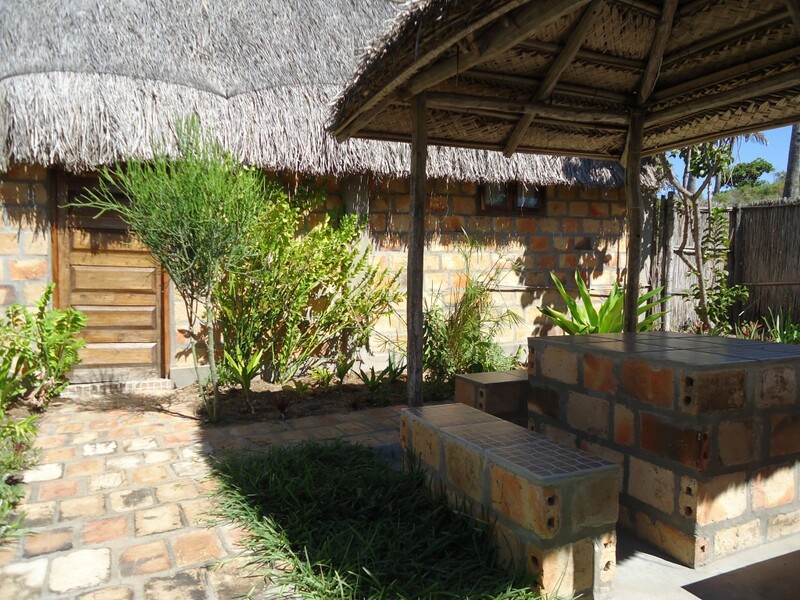 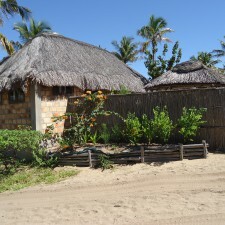 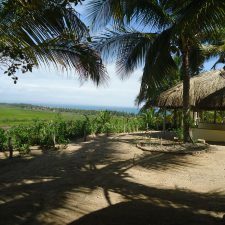 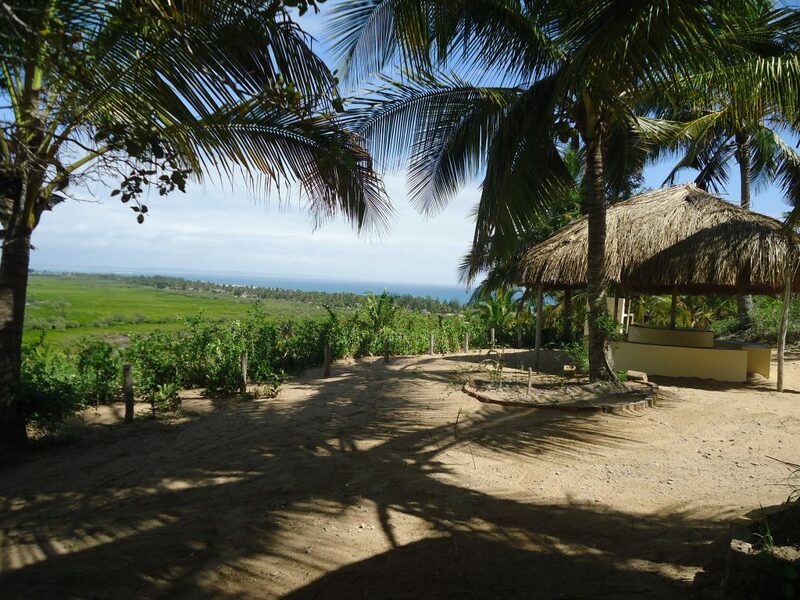 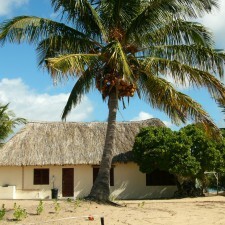 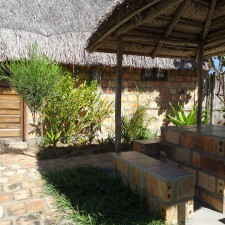 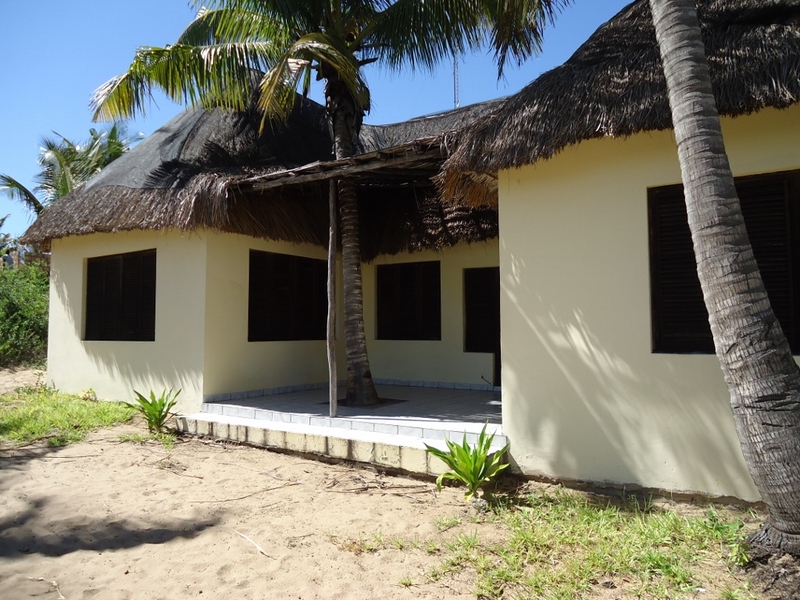 Accommodation in the larger units is offered in cool, tiled chalets with thatched roofs. 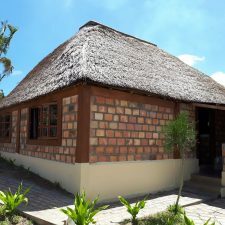 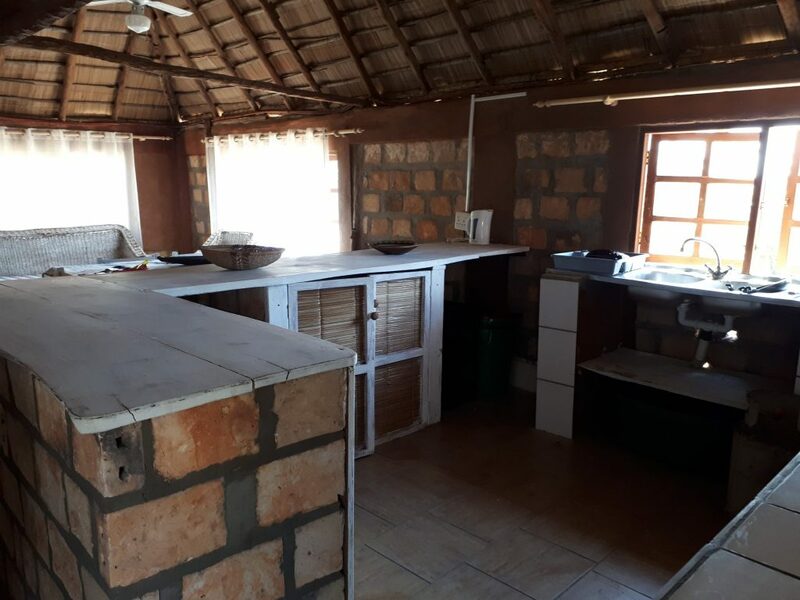 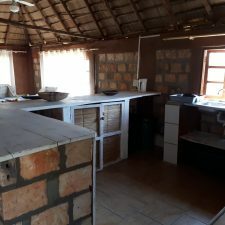 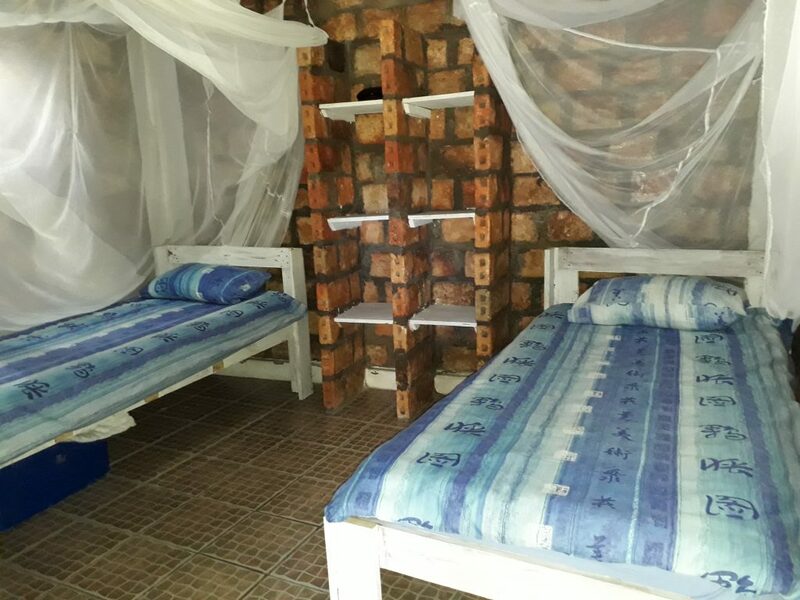 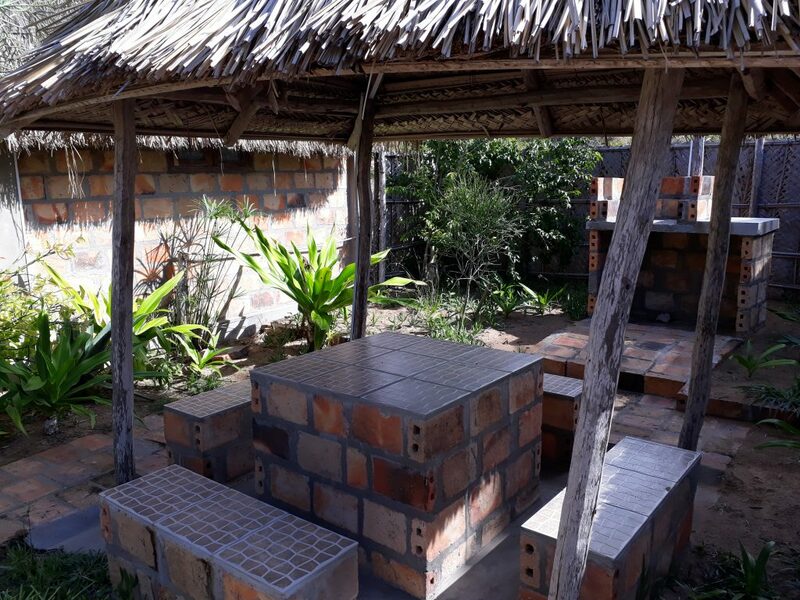 All the basic amenities are supplied including a gas stove, electric fridge, a chest freezer, toaster, kettle, pots, pans, crockery, cutlery, utensils and linen. 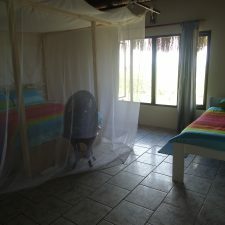 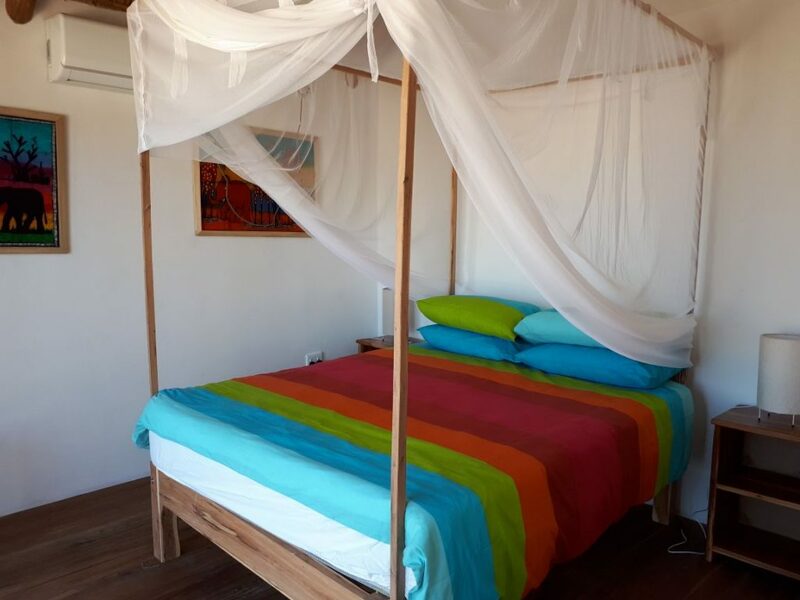 All rooms are fitted with mosquito nets and fans. 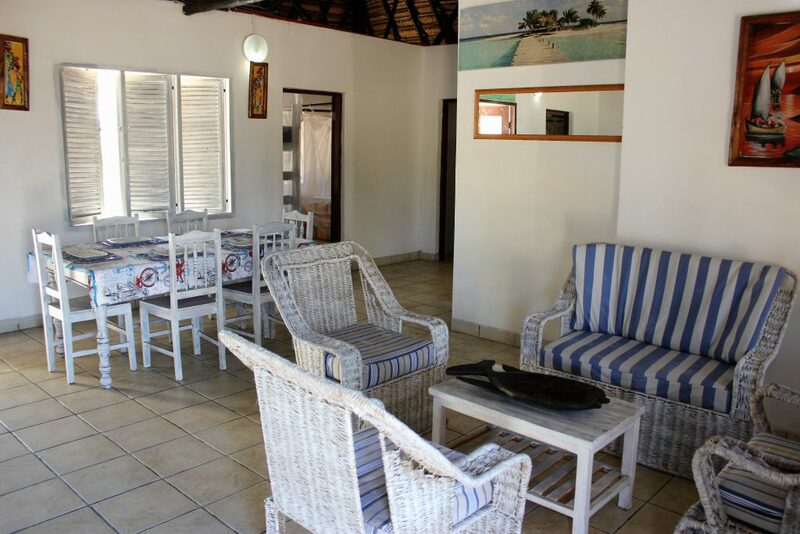 Cottages are serviced once a day, a hand wash and dry laundry service is available at no extra charge. 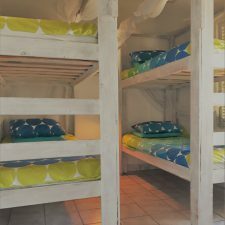 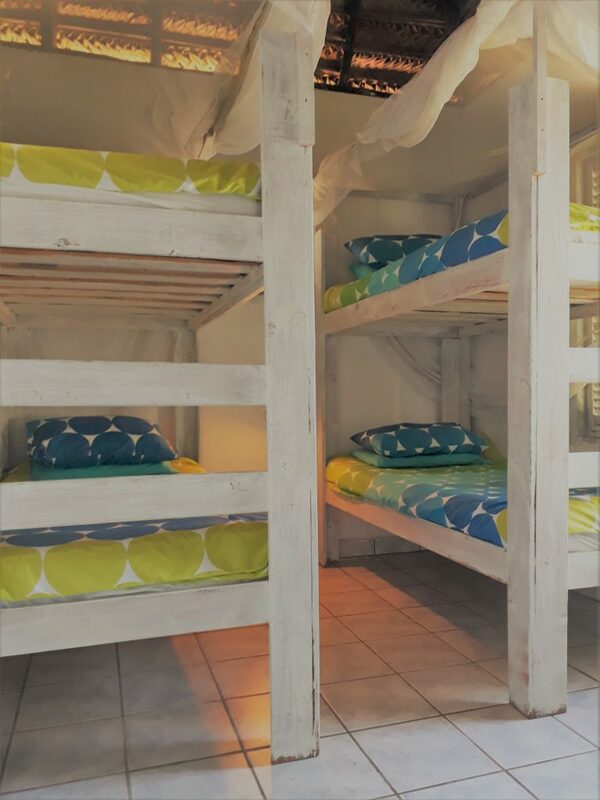 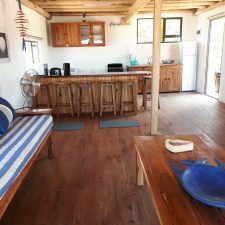 This unit which sleeps up to 6 guests is fully equipped for self-catering purposes and consists of 2 bedrooms (1 double bed & 2 sets of bunks), shower & toilet, open plan kitchen, lounge & dining area. 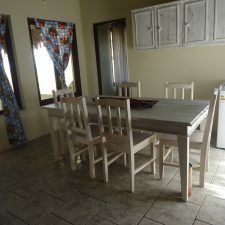 This unit is cool and airy in the hot summers. 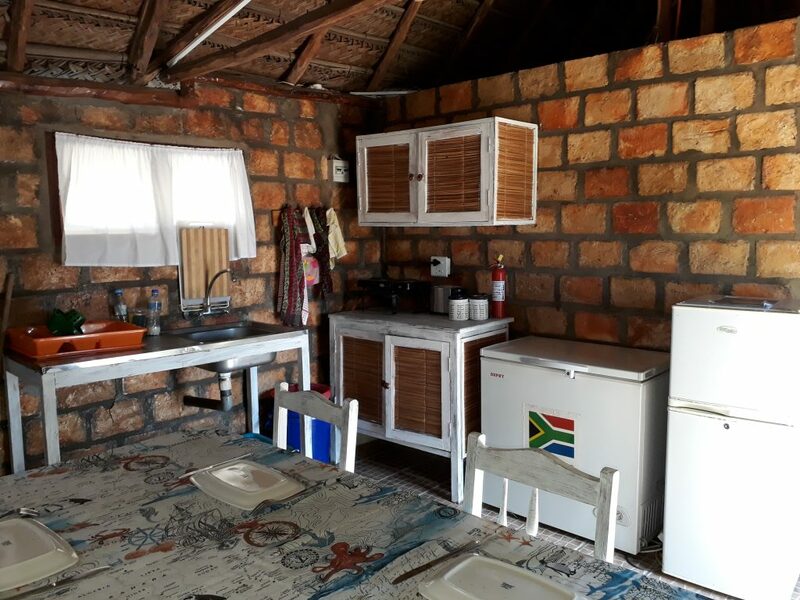 It also has its own braai area. 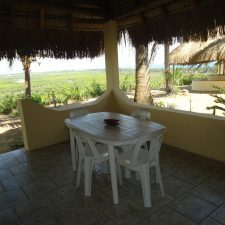 Please note that this unit is not situated close to the main units and does not have sea views. 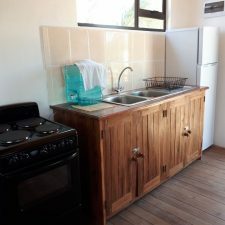 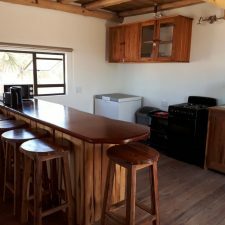 Amenities are supplied including a gas stove, electric fridge, a chest freezer, toaster, kettle, pots, pans, crockery, cutlery, utensils and linen. 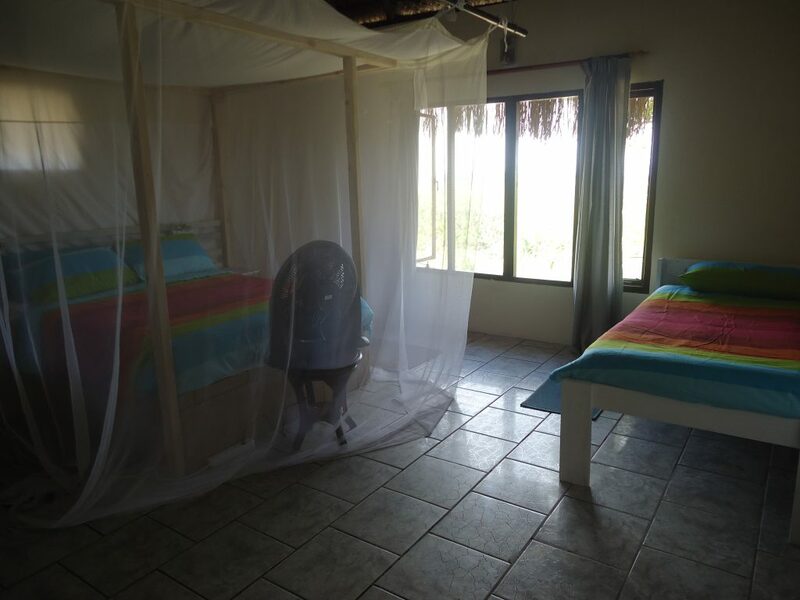 All rooms are fitted with mosquito nets & fans. 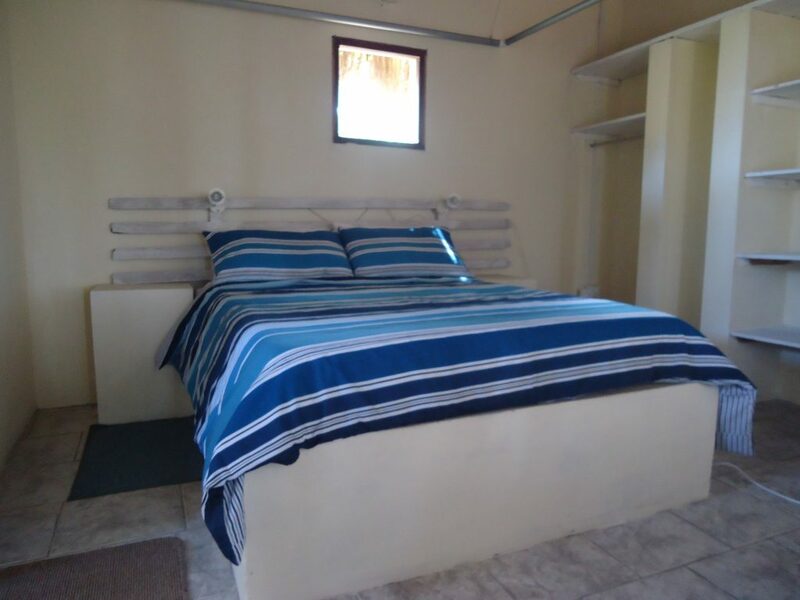 A beautiful two bedroom unit. 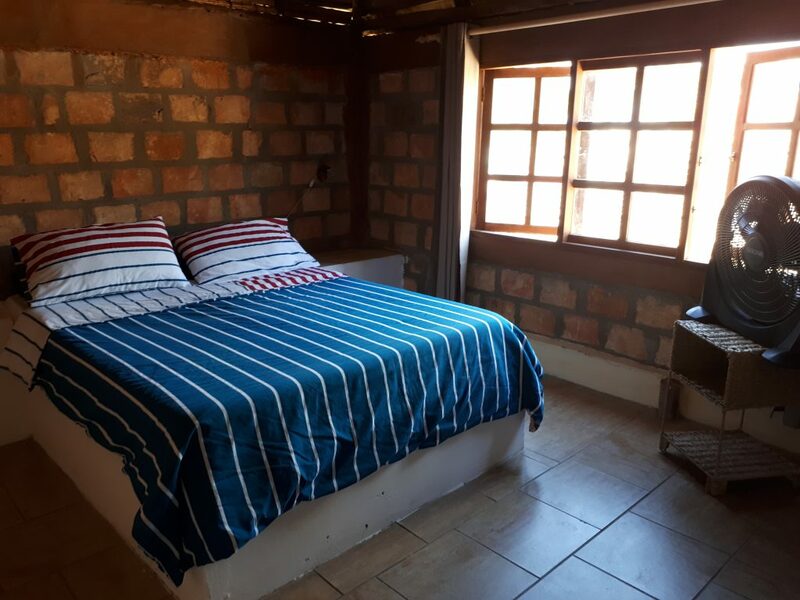 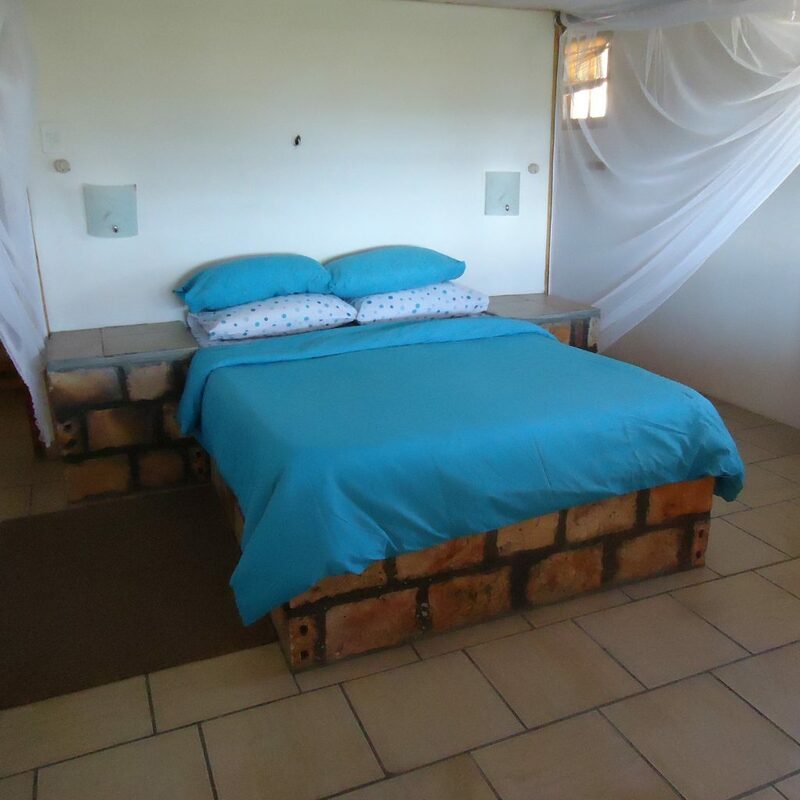 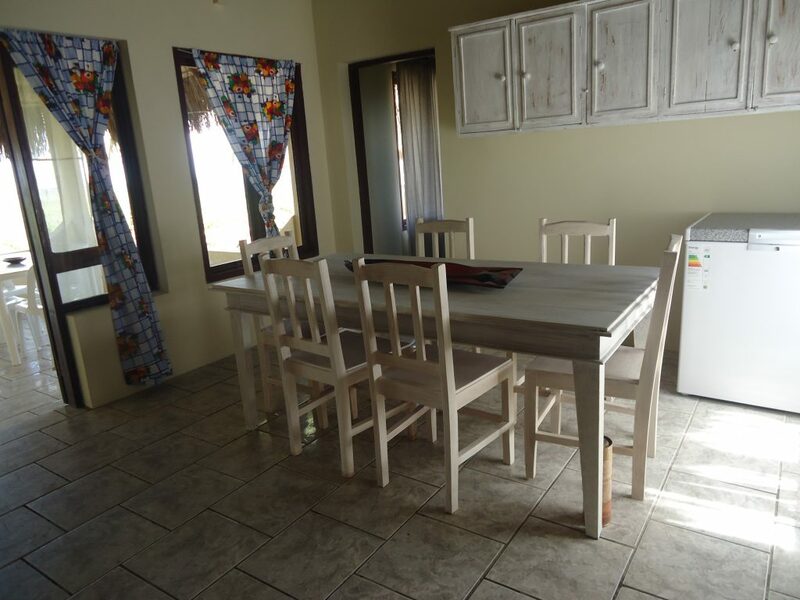 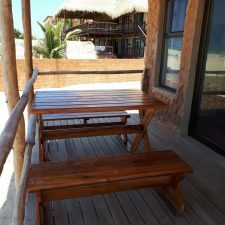 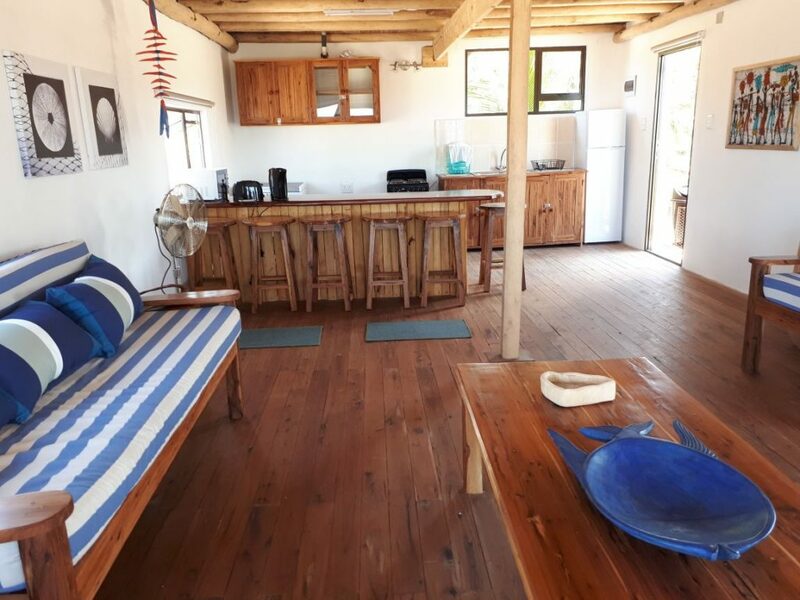 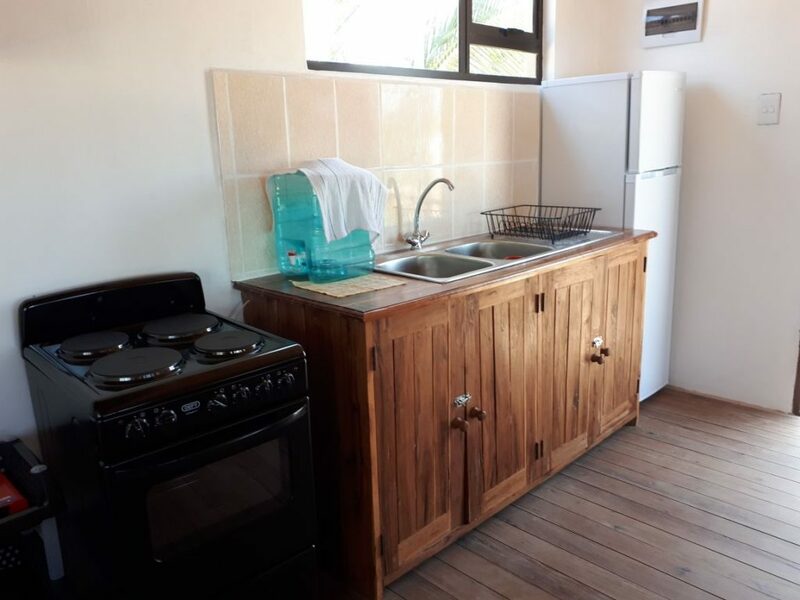 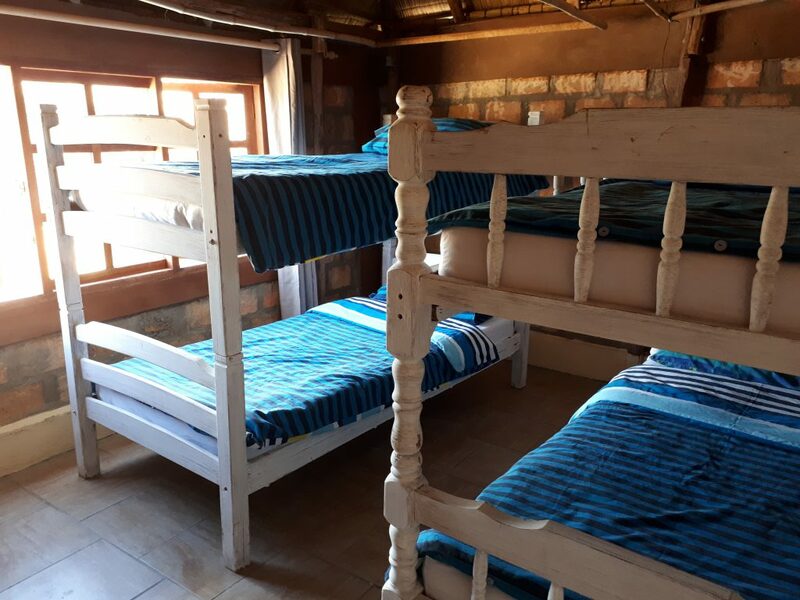 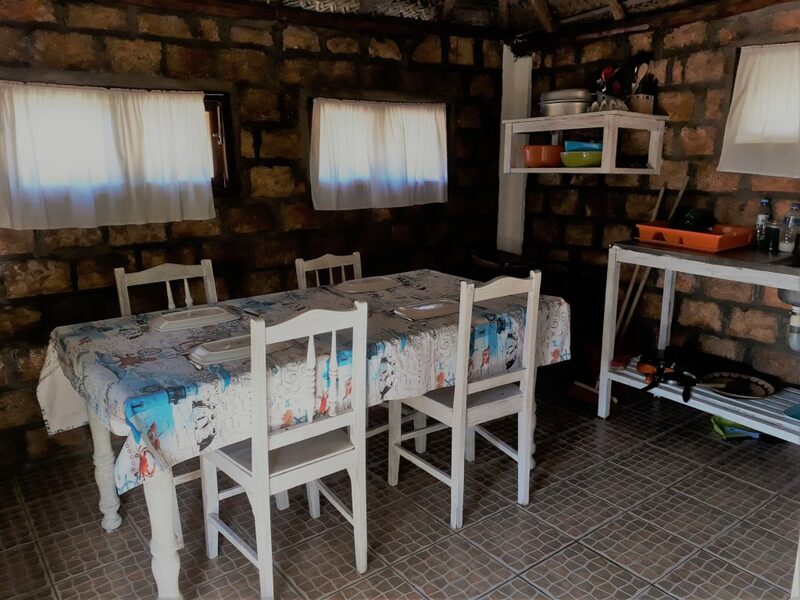 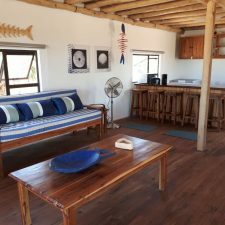 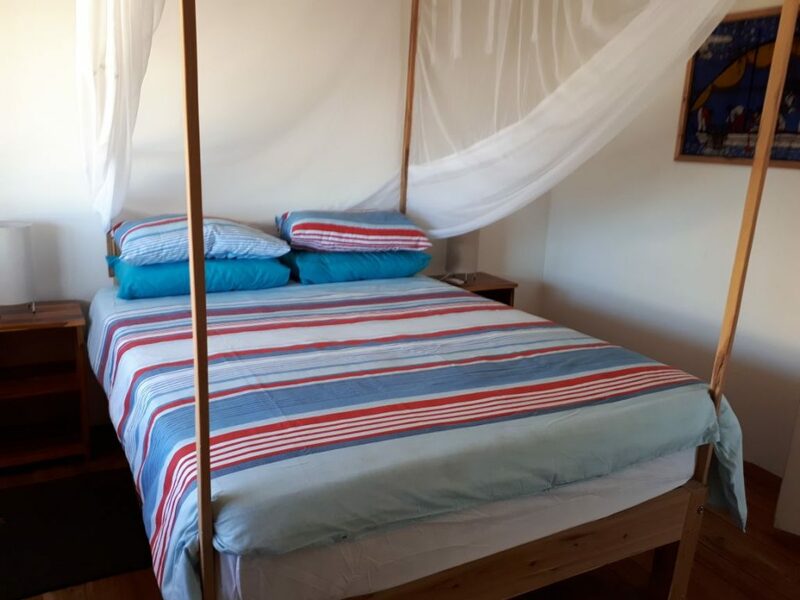 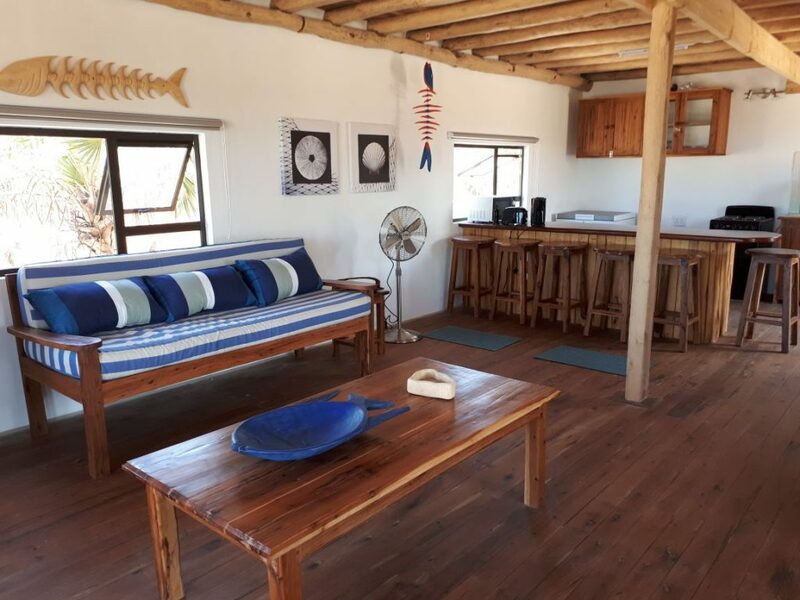 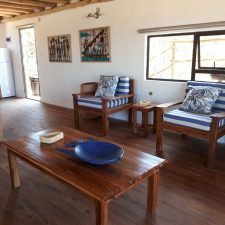 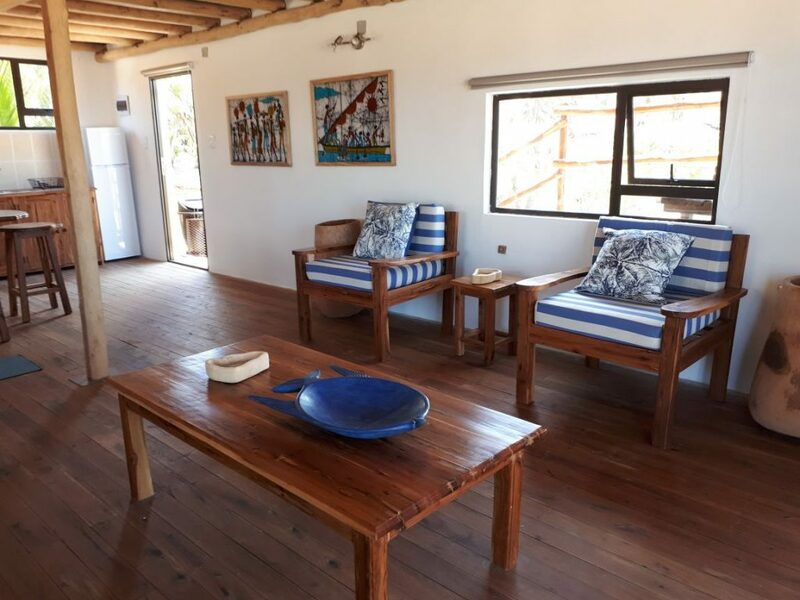 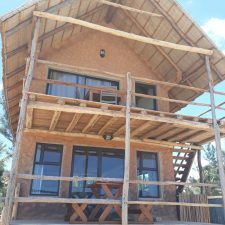 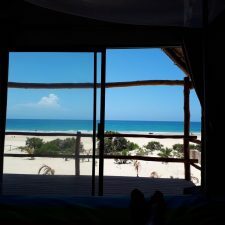 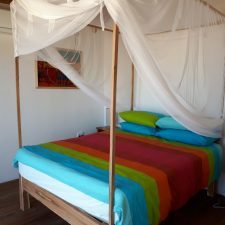 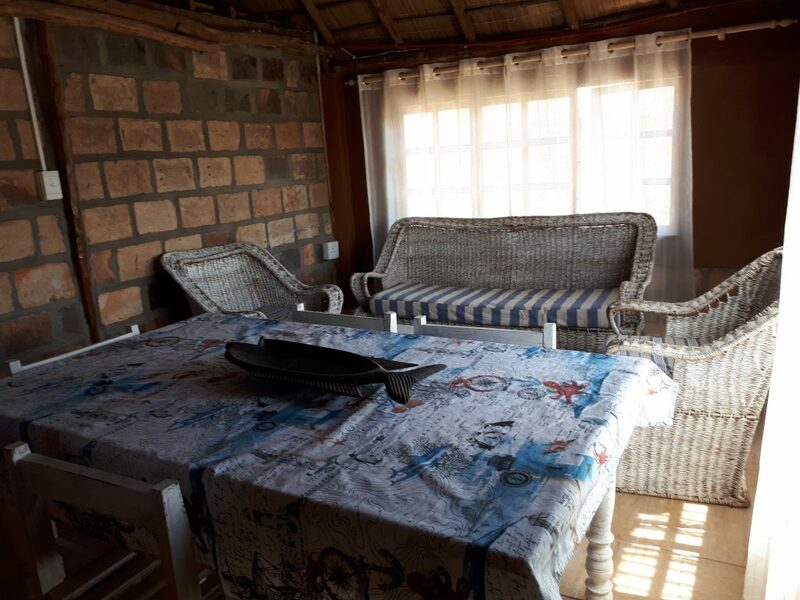 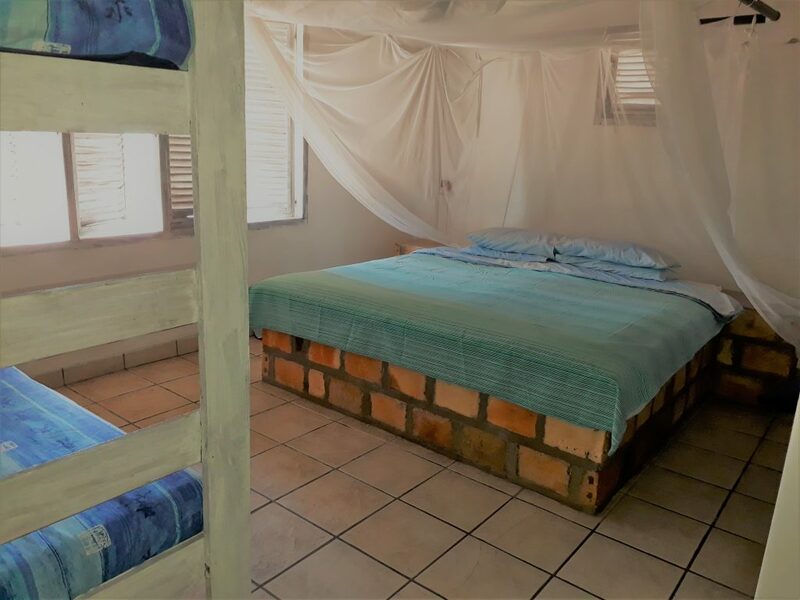 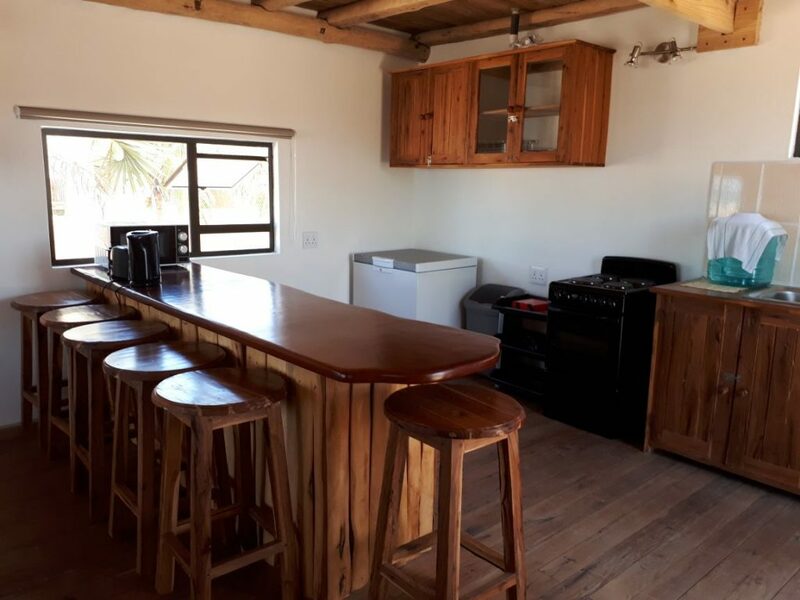 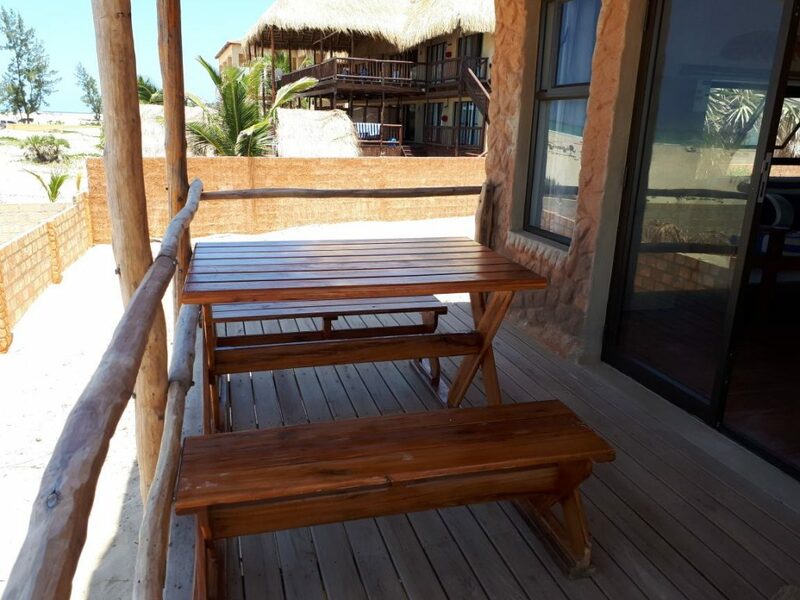 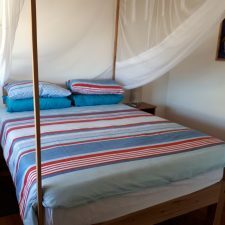 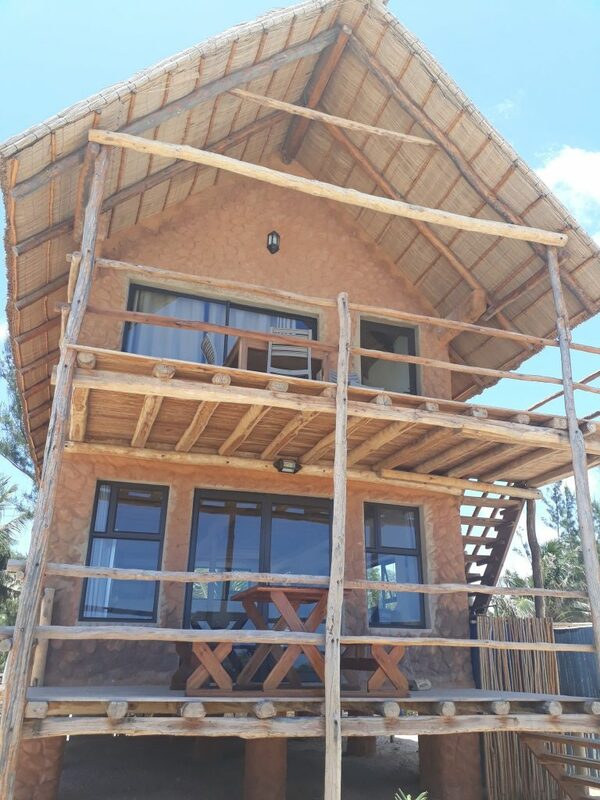 This unit is fully equipped for self catering purposes and consists of 2 bedrooms (bedroom 1 has one double bed and one single bed, bedroom 2 has one double bed), and 2 bathrooms. 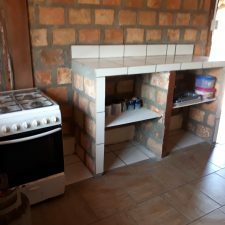 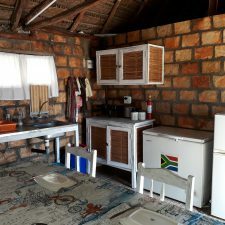 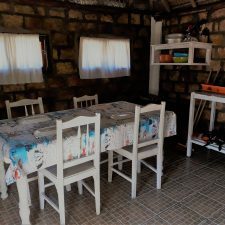 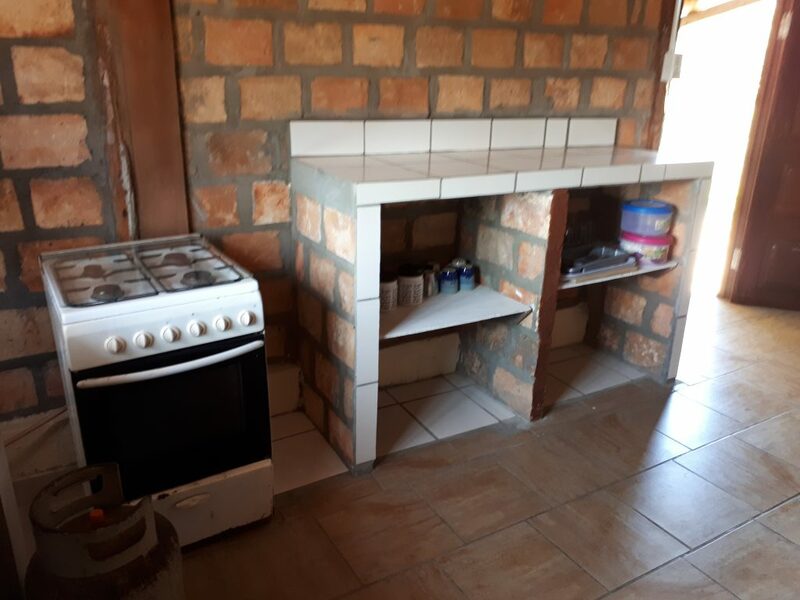 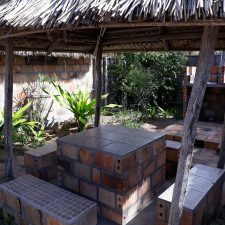 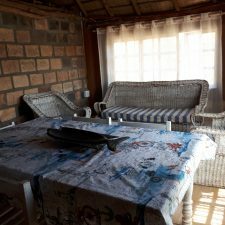 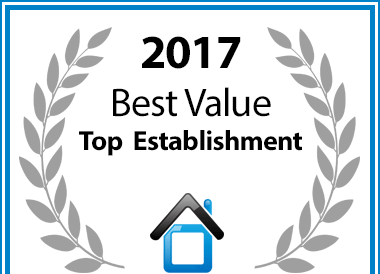 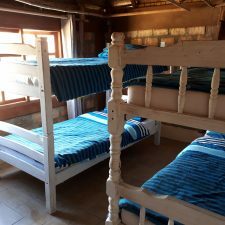 All the basic amenities are supplied including a gas stove, fridge, chest freezer, toaster, kettle, pots, pans, crockery, cutlery, utensils and linen. 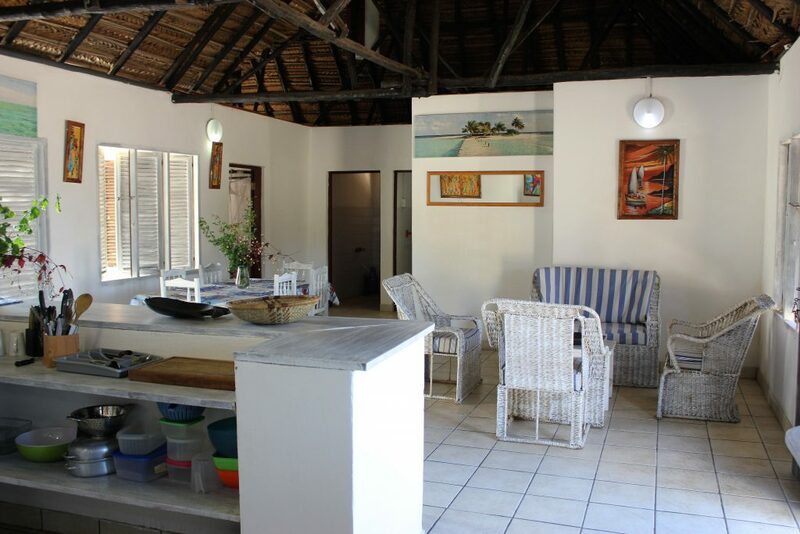 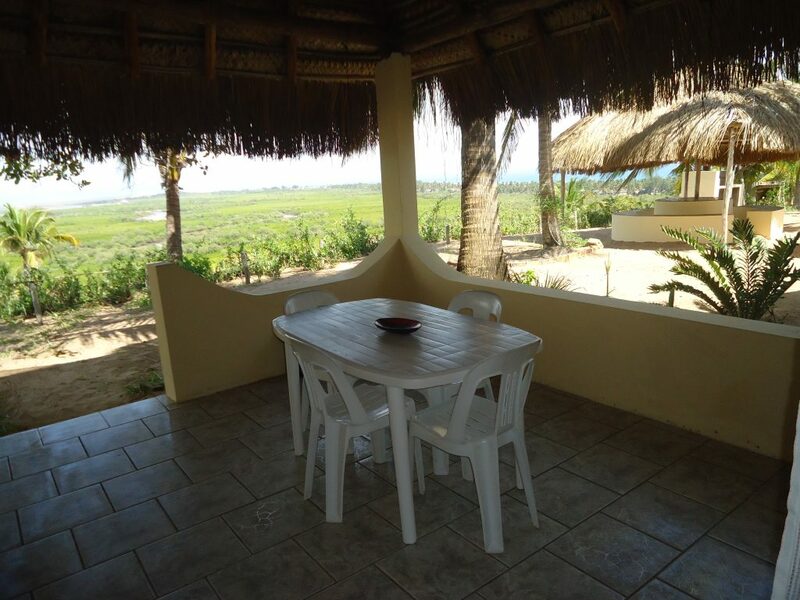 This unit has a lovely braai area and private lapa, outside patio and stunning sea view. 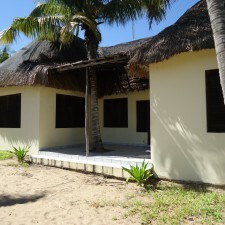 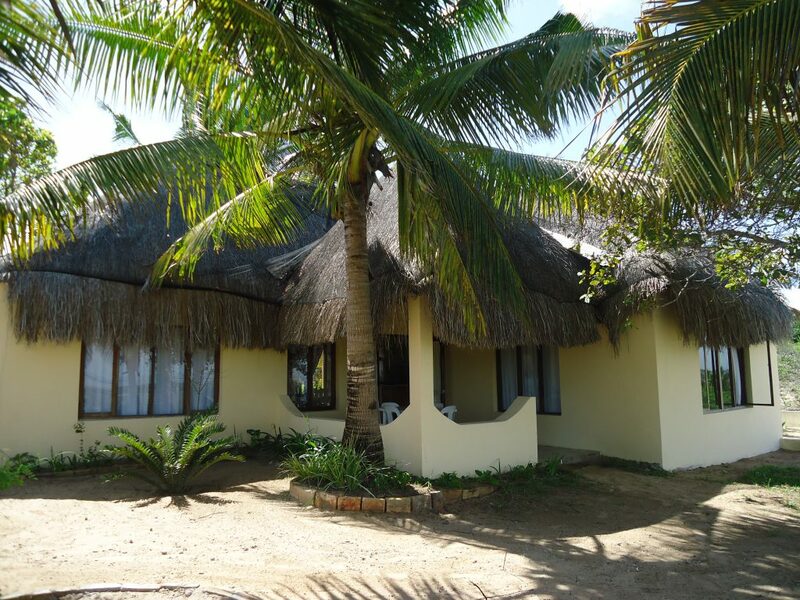 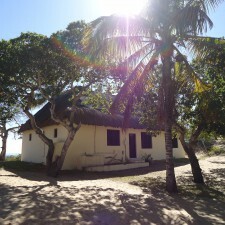 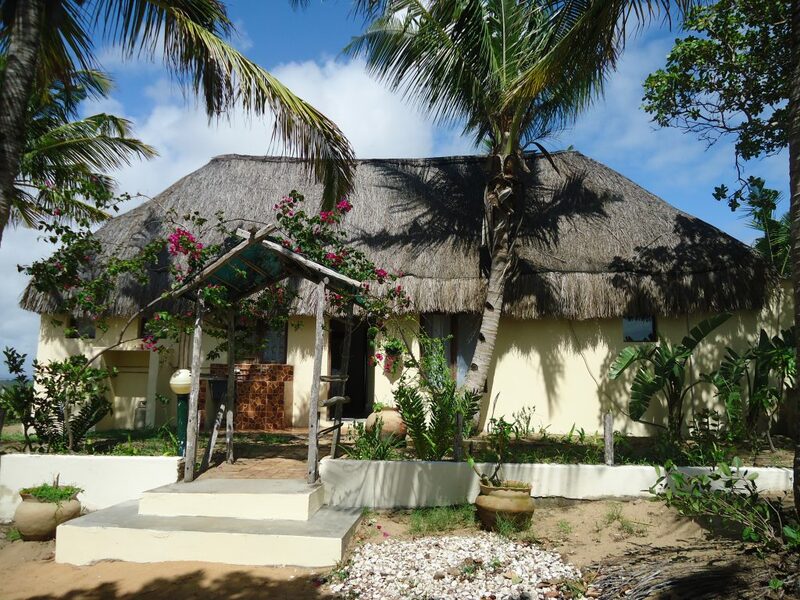 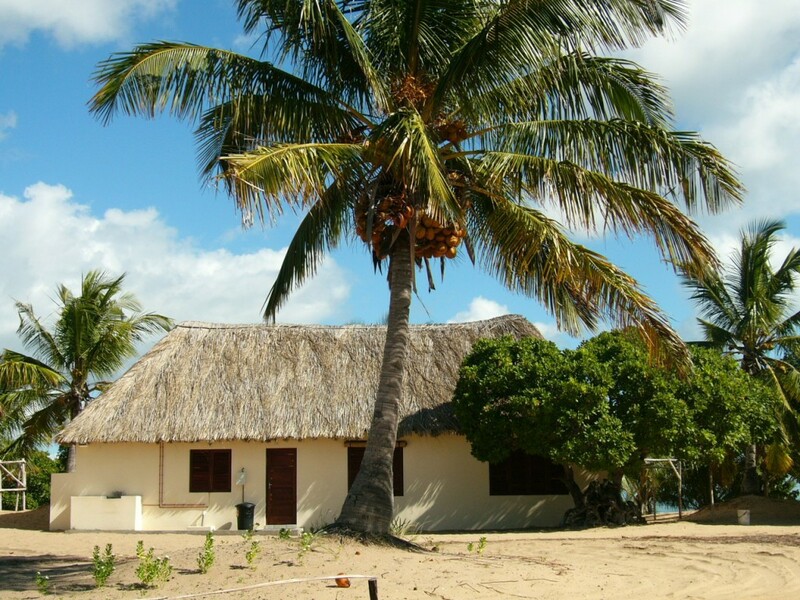 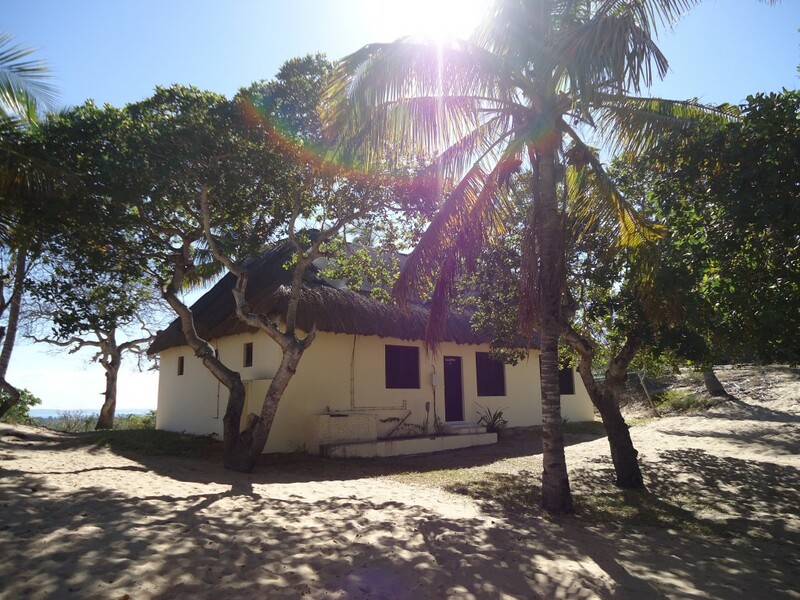 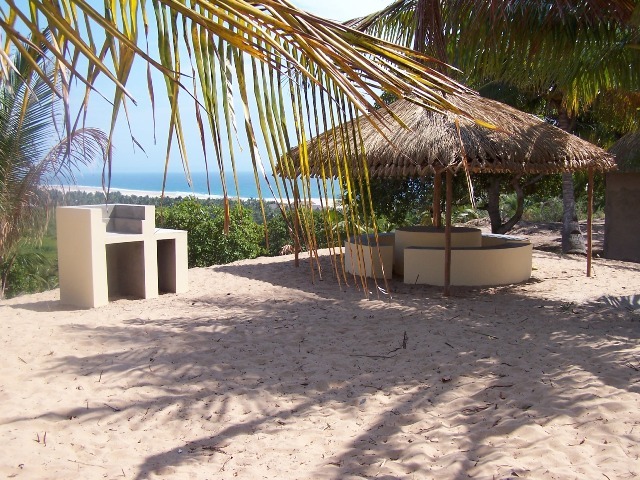 Bama Breeze Beach House is a stunning 2 bedroom unit directly on the beach (no 4x4 required). 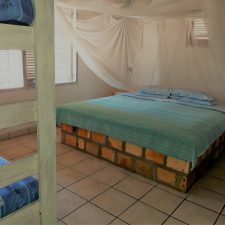 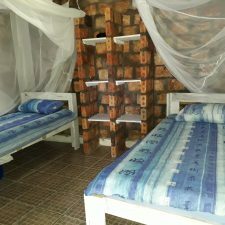 Both bedrooms have aircons and mosquito nets. 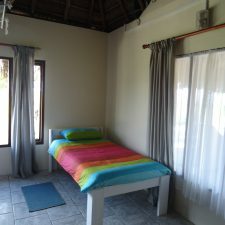 The main bedroom has a spectacular sea view. 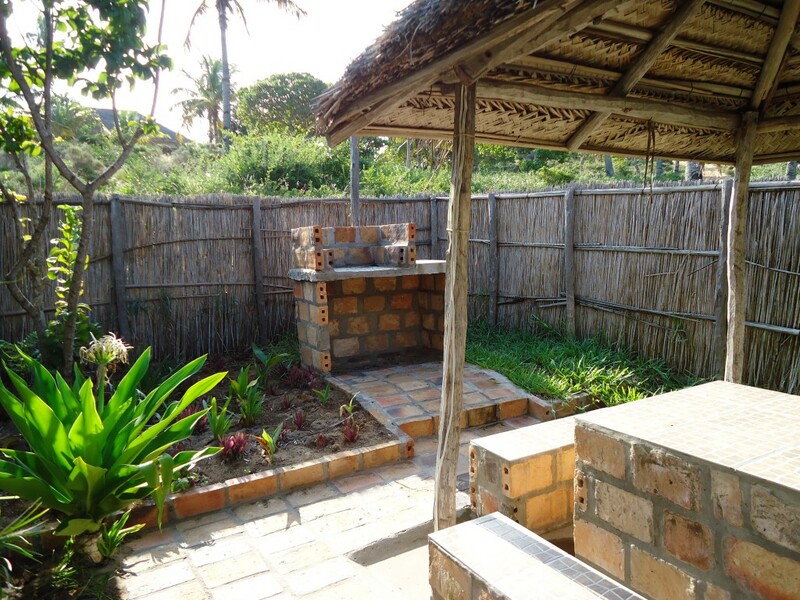 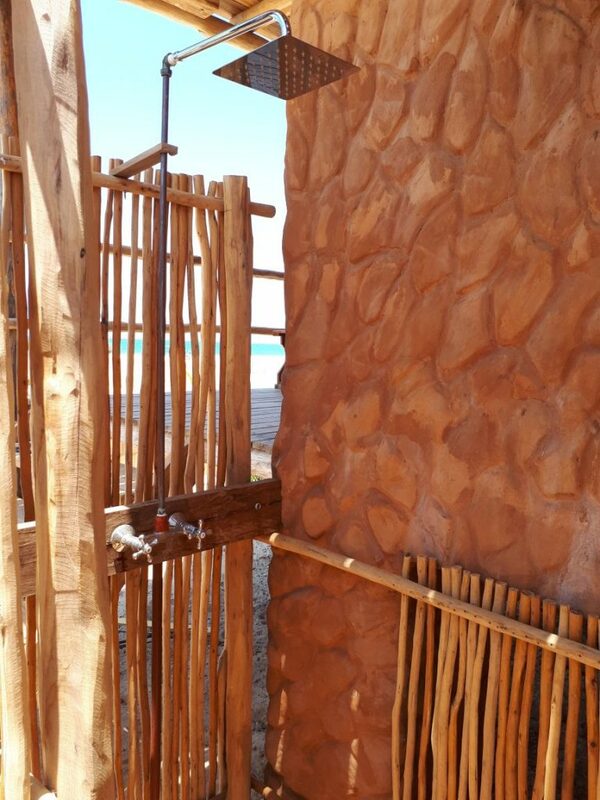 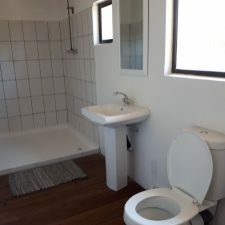 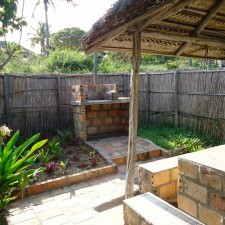 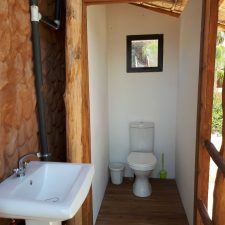 There is a full bathroom inside as well as an additional outside guest toilet and outdoor shower. 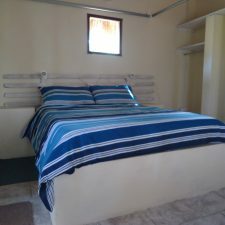 Fully equipped for self-catering, including braai and covered patio. 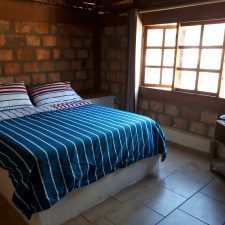 The “Little Brick Cottage” sleeps up to 2 guests in one bedroom with two single beds. 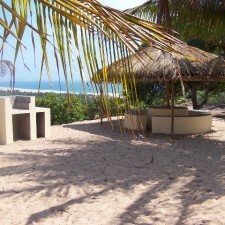 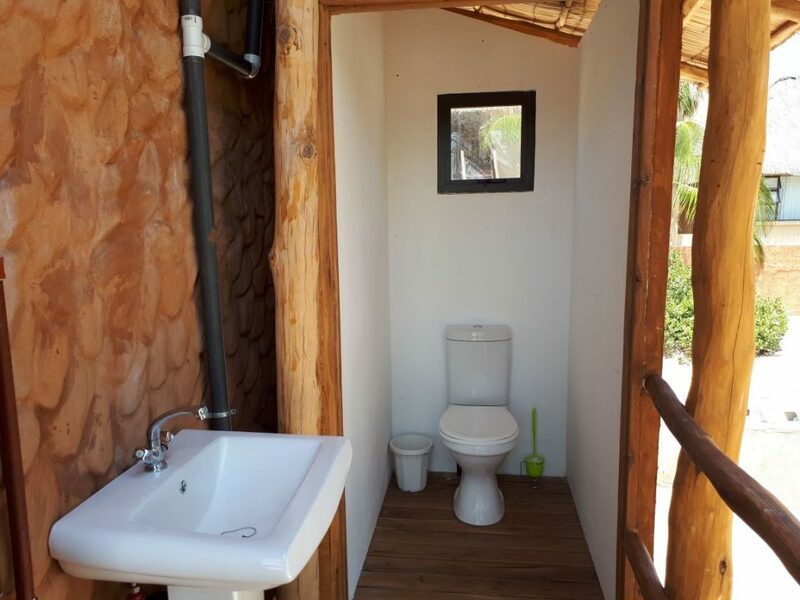 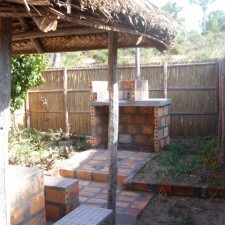 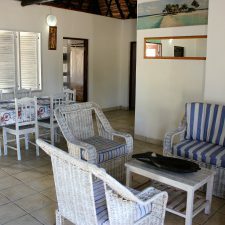 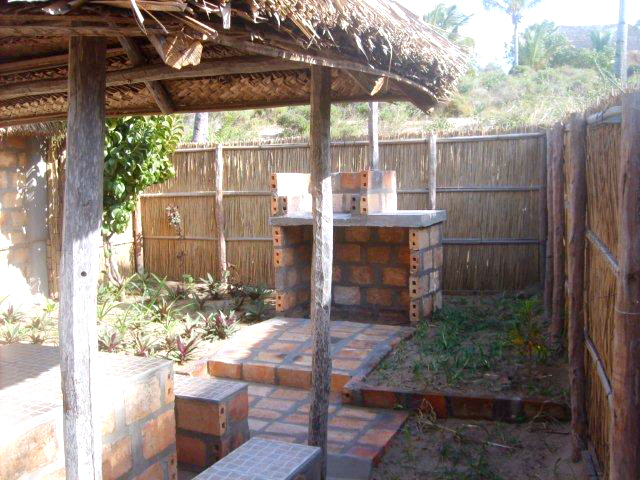 It has one toilet & shower, open plan kitchen, and a lovely braai area with under cover seating. 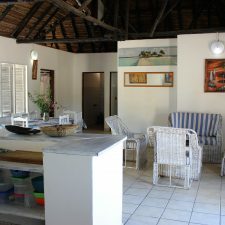 All linen, utensils & appliances are provided. 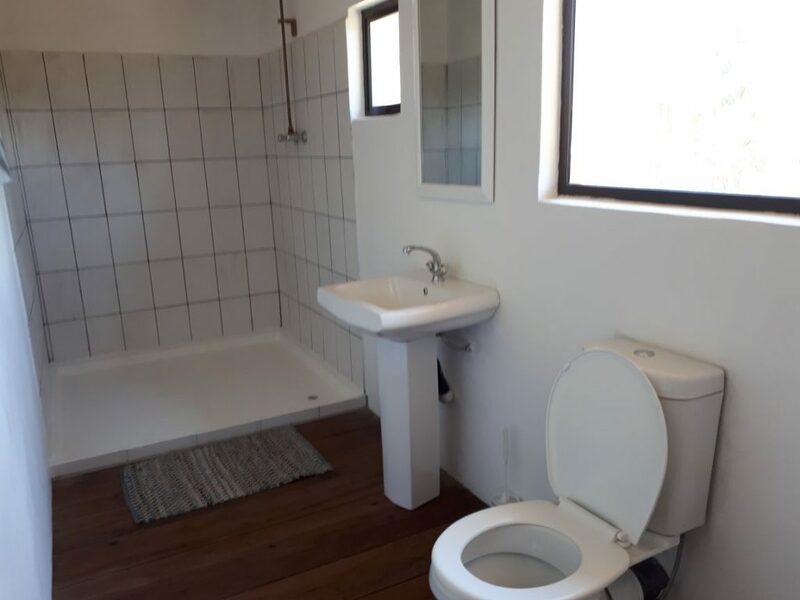 Please bring your own towels.